If there’s one thing tour operators selling African travel ask each other a lot it’s “are you a beach or bush baby?” I would know, I went with 9 of them on a recent whirlwind trip to Tanzania, thanks to fastjet and Serena Hotels, and, as it turns out, this is a really polarising question; travel agents really do end up firmly on either side of the fence. Luckily for Tanzania there really is the best of both worlds on offer. For South Africans, the country tends to get noticed far more for its gorgeous Zanzibar beaches than for what is arguably its even richer treasure chest: the wildlife. Let’s put it into perspective. Some 44% of Tanzania’s area is covered by game parks or wildlife designated areas in some form or another; that’s an area equal to the provinces of Northwest, Limpopo, Mpumalanga, Gauteng and KwaZulu-Natal combined! It has over 20 lakes, 3 of them being Africa’s largest. It also has 20% of Africa’s large mammal population. 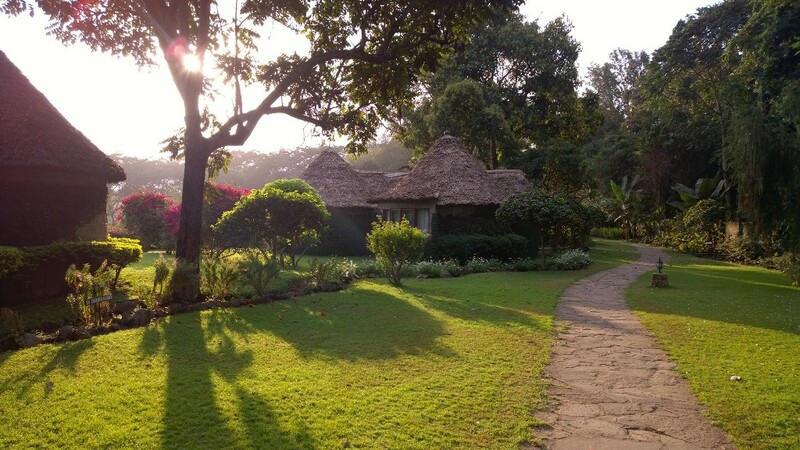 This East African gem truly is a bush baby’s dream come true. It was a long, 4 hour drive across Tanzania’s hinterland to Lake Manyara. Setting off from the cheerful Kilimanjaro International Airport amid whirling dust devils we passed through a bustling and surprisingly leafy Arusha in the shadow of Mount Meru. 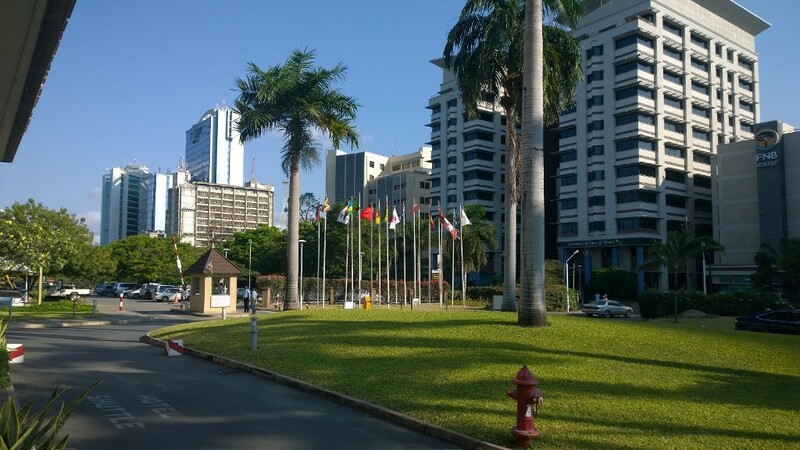 Other than Cape Town or Rio, I don’t know of a city with as striking a backdrop – Meru is a formidable hulk, towering some 3000m above the lush gardens and office blocks of Tanzania’s third largest city. 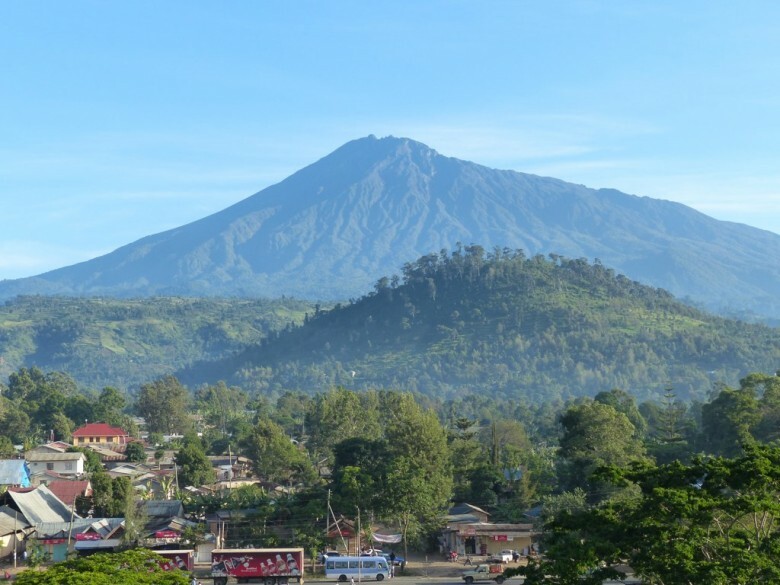 From there the scenery changes dramatically within a kilometre or two from fruit orchards, über-neat coffee plantations and flooded rice-paddies to rocky, sandy desert dotted with lonely acacia trees. Every so often there will be a huddle of cattle sheltering under a tree from the harsh sun and two lonely Masai boys, no older than 7, wandering the dry windswept plains following their livestock. Our guide explained that the Masai, originating in Southern Egypt, have a strict age structure with tasks assigned to each age group. Men in their 30’s and older tend to be elders, ruling on population movements and punishment for crimes. Men in their teens and 20’s tend to be warriors, protecting their clan, while boys from when they can walk until they come of age tend to the cattle. These small kids can cover huge distances each day, barefoot on the desert plains. I couldn’t help thinking how sheltered children in South Africa often are in comparison. Then the scenery changed again, a lush forest springs up on the left of the road as we rise up from the plain alongside baobab thickets on the right. Up, up we go and then suddenly there it was: the eastern arm of the Rift Valley, a vast basin and a lake flecked with the pink of enormous flocks of flamingos, so large that it disappears into the dusty horizon; we’d arrived at Lake Manyara. 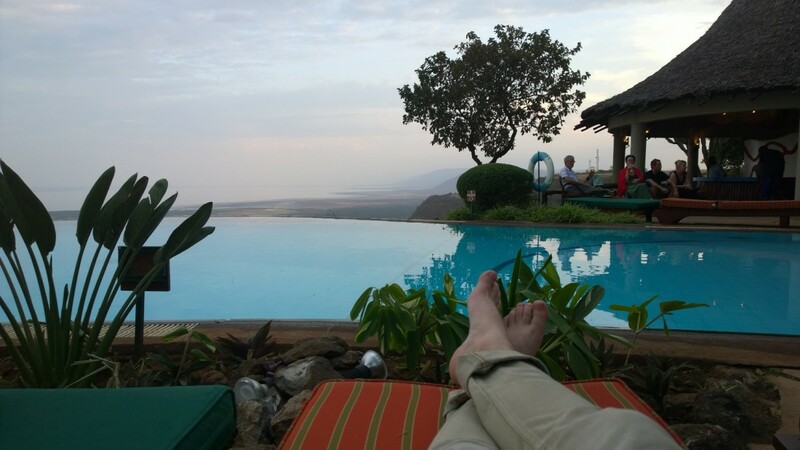 The Lake Manyara Serena Hotel has probably the most spectacular setting of any hotel I’ve ever stayed at. Perched on top of the steep rim of the rift valley, its infinity pool seems to be one with the lake hundreds of meters below. There are perfectly Instagram-worthy vistas from almost anywhere in the hotel and Instagram we certainly did, thanks to the complimentary Wi-Fi all Serena Hotels offer. After some incredible meals and a buffet breakfast to rival any in the world, we descended the escarpment and plunged into the jungle. What’s weird about Lake Manyara’s forest is that while it’s lush and green, the waters which feed the trees don’t fall on them. They fall some 60km away in the Ngorongoro Highlands. All along the road to the lake streams come gushing out of the hillside, instantly spawning a rainforest easily mistakable for those of the Congo as they flow. Blue monkeys swing in the trees and shy buck tread gingerly through the leaf litter. The thick woodland breaks suddenly and the pumice-gravel road extends out onto the vast plain that is Manyara, but aside from it’s vastness, what is most striking is the abundance of game. There are so many animals out in the open – wildebeest, zebra, giraffes, hippos, pelicans and herons all grazing and wading side-by-side – it almost feels as if it’s all staged. 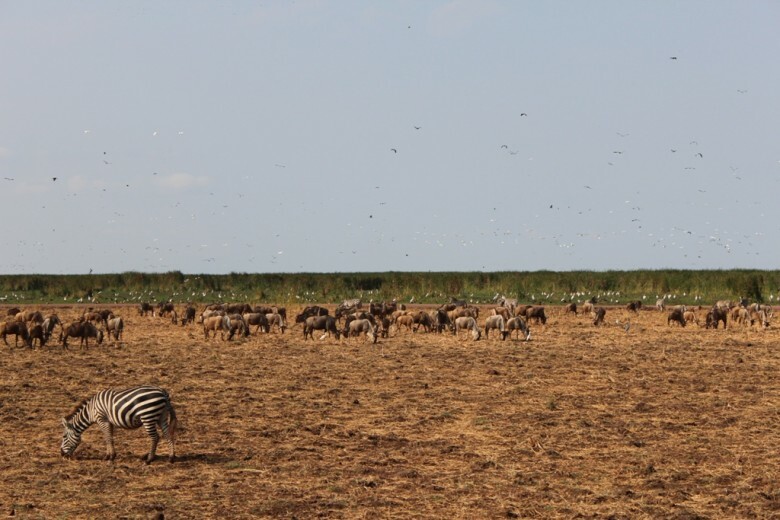 If you’re keen on bird-watching or want to gorge on game-viewing, I can’t imagine a better setting than Manyara. Our 3 hour journey back to Arusha was an opportunity for our guide to explain all the ins and outs of local cultures while some of us dozed off to be woken every few minutes by the regular and enormous speed bumps the locals call “sleeping policemen”. The first rains began to fall and I can only imagine how welcome they must have been. Surely almost as welcome as the cool, wet facecloths we were presented with upon arrival at the Lake Daluti Serena Hotel. This stately hotel in its exquisite gardens is on the site of a colonial era coffee farm and the buildings hark back to a bygone era. The exceptionally courteous staff at the hotel made us feel like we’d been residents for years as we sat out under the enormous trees draped in their bright yellow cup of gold vines in full-bloom. And to drink: what better than Kilimanjaro lager and gin & tonics? 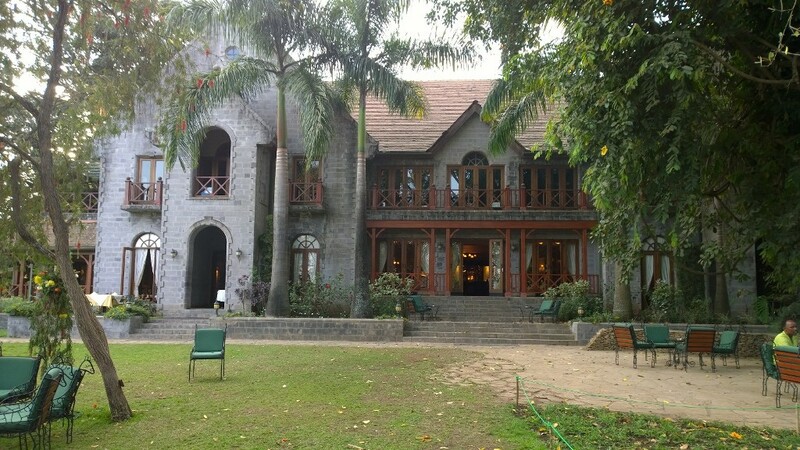 Accommodation is in spacious ronadawels, most with views over the lake with it’s tropical fringe, while meals are served in the formal dining room. 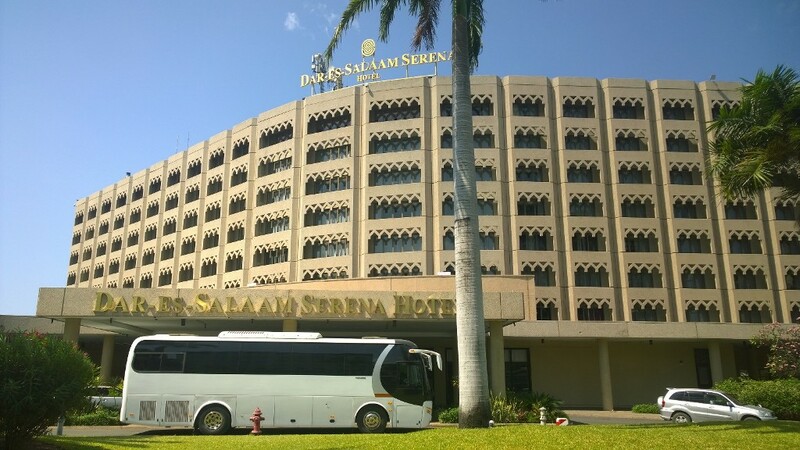 The next morning was a quick trip back to the airport and a short 1 hour flight to the country’s heaving metropolis, Dar es Salaam. I must say I was quite surprised by this big city with it’s one main road, yet skyscrapers to rival our office blocks in South Africa. And Dar is not done yet, wherever you look new malls are springing up, cranes are frantically working to complete the next big thing for the city nicknamed “The Brain” or “Bongo” in Swahili. Our trip was to the city’s sparkling hotel centrepiece, of course you’ve guessed it, the Serena. 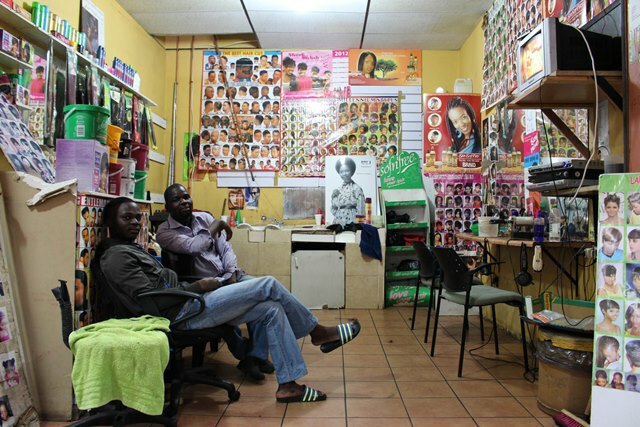 A very conveniently located establishment right across the road from the offices of the likes of FNB and Barclays. The hotel is everything a businessman or conference-goer could wish for, great Wi-Fi, spotlessly clean and opulent with a wide array of conference facilities. And let me not forget: the best lunch I think I’ve ever had from a buffet. If there’s one thing Tanzanians cook well it’s curry and the Serena had the best of it. I think I went back for thirds. I couldn’t help feeling down, heading back to the airport, I just didn’t want to leave this surprising and energetic country. One thing is for sure, I have to come back and soon! We look forward to spoiling you again …..